John Singer Sargent (1856–1925) was born in Florence to American parents. An expatriate, he spent much of his life in England yet traveled extensively in Europe and the United States, ever in search of inspiring subject matter. He trained in Paris and developed a fluid style characterized by vigorous brushwork and a remarkable handling of light. 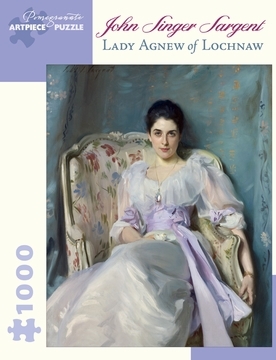 In 1877, before the age of twenty-one, he had earned praise for genre pictures and portraits submitted to the Paris Salons, and in 1898 won great acclaim at London’s Royal Academy for his striking portrait of Gertrude Vernon, the lovely young wife of Andrew Noel Agnew, 9th Baronet of Lochnaw. By his mid-twenties, Sargent was a sought-after portraitist—among the most successful of the Victorian and Edwardian eras—and he would go on to become a celebrated watercolorist.